Servo motors are specially designed motors to be used in control applications and robotics. They are used for precise position and speed control at high torques. It consists of a suitable motor, position sensor and a sophisticated controller. Servo motors can be characterized according the motor controlled by servomechanism, i.e. if DC motor is controlled using servomechanism, it is called as DC Servo motor. 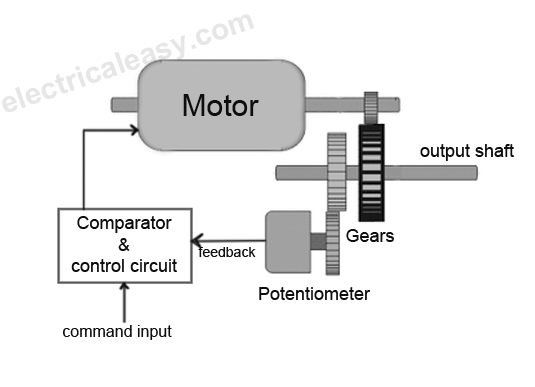 Thus major types of Servo motor may be - (i) DC Servo motor, (ii) AC Servo motor. Servo motors are available in power ratings from fraction of watt upto few 100 watts. They are having high torque capabilities. The rotor of servo motor is made smaller in diameter and longer in length, so that it has low inertia. Servomechanism is basically a closed-loop system, consisting of a controlled device, controller, output sensor and feedback system. The term servomechanism most probably applies to the systems where position and speed is to be controlled. Servo motors are used to control position and speed very precisely, but in a simple case, only position may be controlled. Mechanical position of the shaft can be sensed by using a potentiometer, which is coupled with the motor shaft through gears. The current position of the shaft is converted into electrical signal by the potentiometer, and the compared with the command input signal. In modern servo motors, electronic encoders or sensors are used to sense the position of the shaft. Command input is given according to the required position of the shaft. If the feedback signal differs from the given input, an error signal is generated. This error signal is then amplified and applied as the input to the motor, which causes the motor to rotate. And when the shaft reaches to the required position, error signal becomes zero, and hence the motor stays standstill holding the position. The command input is given in the form of electrical pulses. 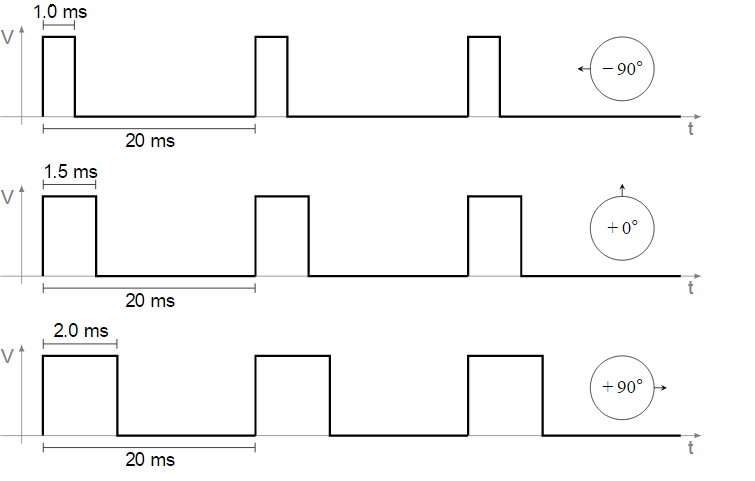 As the actual input applied to the motor is the difference between feedback signal (current position) and applied signal (required position), speed of the motor is proportional to the difference between the current position and the required position. The amount of power required by the motor is proportional to the distance it needs to travel. How is the servo motor controlled? Usually a servomotor turns 90° in either direction, i.e. maximum movement can be 180°. A normal servo motor cannot rotate any further due to a built-in mechanical stop. 1ms will move the shaft anticlockwise at -90°, a pulse of 1.5ms will move the shaft at the neutral position that 0° and a pulse of 2ms will move the shaft clockwise at +90°. When servo motor is commanded to move by applying pulses of appropriate width, the shaft moves to and holds the required position. If an external force is trying to change the position of the shaft, the motor resists to change. Pulses need to be repeated for the motor to hold the position. 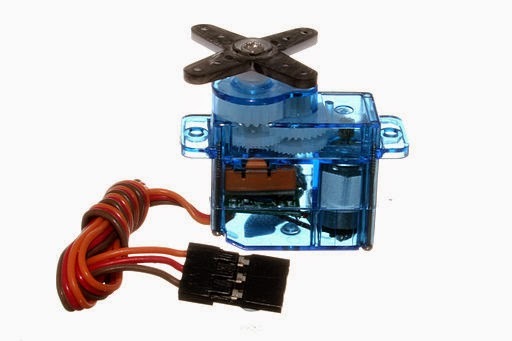 Servo motors are popularly used in robotics, computers, CD/DVD players, toys etc. Servos are extensively used in those application where a specific task is to be done repeatedly in a very precise manner.